Walking the dog is my job most of the time, which is really okay with me. Before the sun rises, Bo and I walk around the neighborhood; she sniffs for rabbits, I listen to praise music on my ipod and talk to God. If we didn’t have a dog, I’d be less likely to get up and go every morning, so I guess you could say Bo has contributed significantly to my spiritual life. I’ve found I like getting up early to greet the day with a breath of fresh air on nice spring, summer and fall mornings. Winter, though….not so much. So my husband and I have worked out a system. When Daylight Savings Time ends in the fall, he takes over the morning dog routine on Tuesday, Wednesday and Thursday, while I have Friday through Monday. Not quite even, but then again, there are an odd number of days in the week. Imagine my delight this morning, as we were discussing the coming transfer of dog duties, when he made a remarkable suggestion. “How about a duet walk on Saturdays? We could walk Bo together and go get a coffee.” A duet walk. Never in my life have I heard anything so sweet come from my man. A duet walk. I was astonished and amazed. Instead of suggesting we take turns on Saturday, letting the other sleep in, he proposed a duet. I guess that’s what we have been these past thirty-one years: a duet. 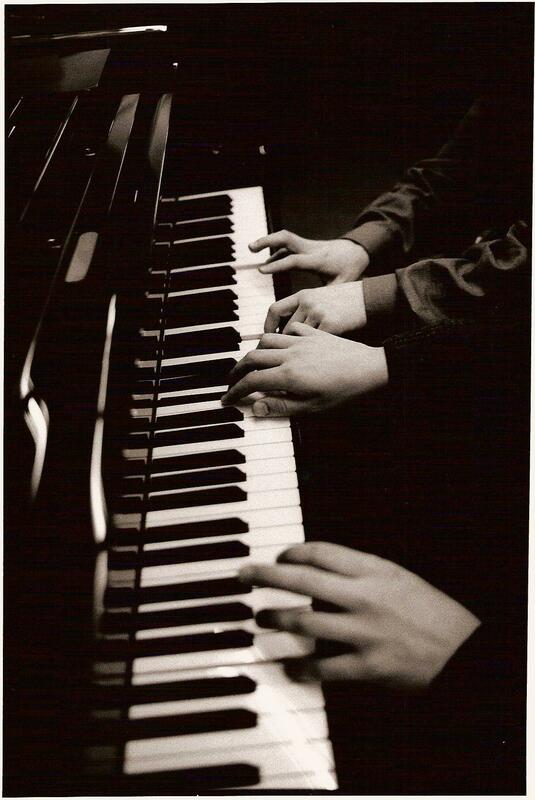 Each one playing a melody, but harmonizing with each other to create a life that neither could produce on our own. There have been some dissonant times, probably when we just weren’t listening very well to each other; but, oh, when we’re on the same page and in sync with each other…..
From now on I am going to introduce him as my duet partner. Dont worry, i’ll get the extra sleep for both of you on saturdays. SAM! You read my blog!! Ha! You have no idea what goes on around here every morning! But then, I have no idea what goes on after midnight…. Hey Michelle! Thanks for reading and for your comments! Duet partner? I love that. And I love this blog. After we left, I came home and typed in your blog address, thinking I would just read maybe one or two tonight. But while Riley and Hannah are worn out after their very fun day today, I find myself clicking on month after month, reading every word. Your blog has been bookmarked. I’ll be back. 🙂 It was so wonderful seeing you guys! Thank you for the encouragement today! I hope you enjoyed Ka! I love you! Kirsten! Thanks for reading! We had such a fun time seeing everyone! Your kids are great entertainment! Keep in touch!